The Most Affordable Math Program I Know Of! I’ve been homeschooling my six children for most of the past 20 years, so it would be fair to say that we have used quite a few different math programs. With so many different issues and needs for each child and circumstance over the years, it’s only natural that one size hasn’t fit all. A couple years ago some of my kids needed something different for their math, and after considering several options we decided to try CTCMath. The simplicity and affordability of it had a huge appeal. I was looking at needing 3-4 different math levels, which in every other program I was considering would have been $150-200 per child. CTC offers math for all levels from Kindergarten through Trigonometry, at one low price that covers the whole family! Boom! Yes! For one bargain price ALL of my kids could use CTC, and as they leveled up or needed to refresh their memories about a particular aspect of math that year, there was nothing else to buy. What a relief! Not only that, but CTC does all the heavy lifting of TEACHING and GRADING! Oh yeah. No more sessions with me struggling to figure out how to explain a concept. No sirree. Instead, each lesson is taught via streaming video where you can hear the teacher and see how to work the math examples right in front of you, before working the math problems yourself and entering your answers into the CTC site. The system gives immediate feedback if their answers are right or wrong, which I really appreciate since it’s important for them to know right away if they aren’t understanding a concept. You can immediately take action to re-work a problem and make sure the student understands before going on. I also loved it that my kids could access their CTCMath on their Kindle Fires. When we started with CTC they didn’t have laptops, and with 4 kids using the program, it wasn’t practical to all share the same computer. The options for accessibility are awesome. CTC will also work on your ipads and tablets. Very handy! The family plan is set up to include 5 children in a family, but if you have more kids than that, you can easily contact CTC support and they will add more students to your account at no extra charge. So nice for large families, and what a blessing financially! You can play a demo and watch a sample lesson here. Diagnostic tests at the start of each unit help you and your child determine if they need to do that section or if they can safely bypass it and go on to the next. This was helpful for us, coming from a different math program. Since each math program seems to have its own order of doing things, it isn’t always straightforward to find where your child fits when switching to a different curricula. The diagnostic tests helped us avoid “gaps” AND repetition of concepts already mastered. 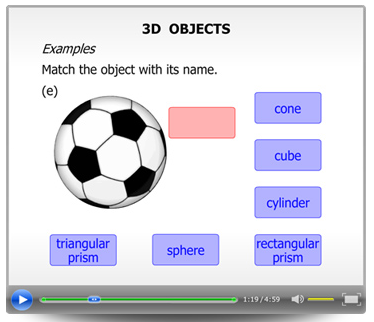 My son Isaac is using CTCMath again this year, and he really like the videos and the teacher. We have used some other video-based teaching programs before, but this one seems to make the most sense to him, and the teaching style is pleasant and engaging. Isaac is able to work through several lessons each day during his math time, and he seems happy doing so. The program corrects his work as he goes, so he’s able to work through anything he missed and see solutions if something went wrong. One fun aspect of the program is that periodically my son reaches milestones in the program and we get an email congratulating him and telling him about his accomplishment. And each week I get a summary of the work that’s been done and what grades he has earned, so if I haven’t been paying super close attention, that’s my opportunity to get back on track and know what’s been happening with his math. For children that are using other math programs, CTC can still come in handy. If they get stuck on a concept, we can pop over to CTC and let them watch the video lesson. Often this provides a different way to approach the problem, and that does the trick for helping them understand the concepts in a different way. So, CTC works well as a tutoring option as well! 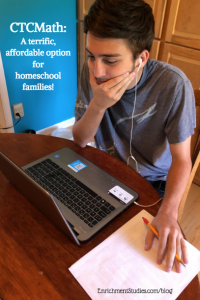 CTCMath is currently offering an awesome deal for homeschool families. You can get 60% off their already very reasonable prices! This 12 month deal costs less than what I paid *per child* for our last math program, and this covers ALL of the kids in your household at ALL levels!!! And as if that wasn’t a compelling enough offer, they offer a 12-month money back guarantee! You can’t beat that! I hope that learning a little more about CTCMath and our experience with it has been helpful to you. We have really appreciated it at our house. Disclosure: CTCMath sponsored this post, but I paid for our CTCMath membership myself. The opinions expressed here are my own.